I don't actually drink a lot of milk (half & half and cheese are entirely different stories). However, when I do buy milk, I've started to insist on returnable bottles from a local milk producer. Certainly, using returnable bottles doesn't completely mitigate the costs of packaging. However, unlike recycling, when I return my bottle to the store (and get my $1.50 deposit returned), I'm fairly confident that the bottle is going back to the dairy for another round with the lovely cows. Since the milk is produced locally, it doesn't have to endure ultra-pasteurization. While this process helps keep milk from going bad while traveling long distances, it has the negative side-effect of destroying the proteins used in cheese making. 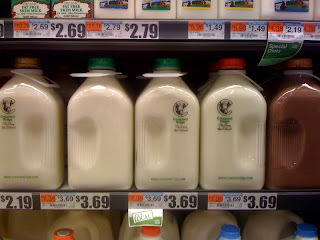 Since I use most of my milk for cheese and other dairy products, fresh and local is a must.